Include your complete work history. You will likely remember colleagues and classmates you may have forgotten. Those contacts will be able to search for you based on what is in your profile and most social networking sites will suggest people that share these groups or interests. By adding connections and editing your profile, you are more likely to be at the top of the list when somebody searches for a company like yours. Each time you edit your profile, the information will be circulated to your network, which regularly puts your name in front of your contacts. Use the status field to put in updates. This information is usually sent in emails to others that are connected, share an affinity group or are following specific people. Joining professional groups within LinkedIn gives you opportunities to provide input and gain exposure. Whether it’s your own industry, or one your business serves, professional groups are an excellent way to generate new contacts through the online Q&A section. By posting answers in the questions online, you can share with others what you know. If you have good answers, it will create an interest in knowing more about your services. Recommendations are always an excellent source of credibility and your recommendations are always there for anyone to see. If you keep abreast of your affinity groups or browse the profiles of competitors, you will likely find new ideas. This can be done by searches online, but the content is distilled better in social networks. If you know of specific business that fits your target market, you can learn a great deal about them in social networks. In addition to knowing the background of the key people, you might be able to find shared connections or shared affinity groups e.g. alma maters. This can make your first contact much smoother. If your public profile is set to full view, Google will index your profile and your Linked In page will draw more traffic. If you use Linked In to showcase your talents well, your website will gain traffic. You can increase traffic to all sites by cross-linking from social network sites, your own blog and posts you make to other blogs. Google yourself and see what shows up. If your online strategy is working, you should see more links and more relevant information show up first. If your own website is not at the top of the list, consider some new strategies for enhancing the virtual you. Did You Know LinkedIn is Connected with Twitter? 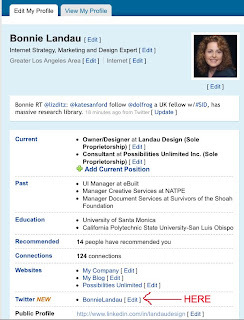 Posted by Bonnie Landau on 19 Dec 2009 under LinkedIn, Twitter | Comments Off on Did You Know LinkedIn is Connected with Twitter? LinkedIn has employed a fun new tool that allows you to pull your Twitter tweets into your LinkedIn profile. These tools combined can make these two arenas even more powerful for sharing your ideas. The icon for this marriage is the peanut butter/chocolate introduction made popular by Reese’s many decades ago. To take advantage of this new connection, simply click on the edit button on the Twitter line on your profile page (see red arrow on screenshot). Follow the simple instructions, and now your Twitter and LinkedIn accounts will be connected. There are variables when setting this connection that allow you to indicate of you want all tweets shared on LinkedIn, or only tweets that include a #in hashtag. In this way you are in control of what does and does not show up. Why is this helpful? First of all, your Tweets can now be shown on your LinkedIn account, which means you can share information without extra effort. Also, your LinkedIn status will be updated when you Tweet, which means your LinkedIn profile will always be recently updated, which keeps you at the top of search results. You can also now tweet from within your LinkedIn account, which saves more time as you share your information across multiple networks. For a more detailed overview of this feature, visit the LinkedIn Learning center. or view this online video tutorial to setup a LinkedIn/Twitter connection.